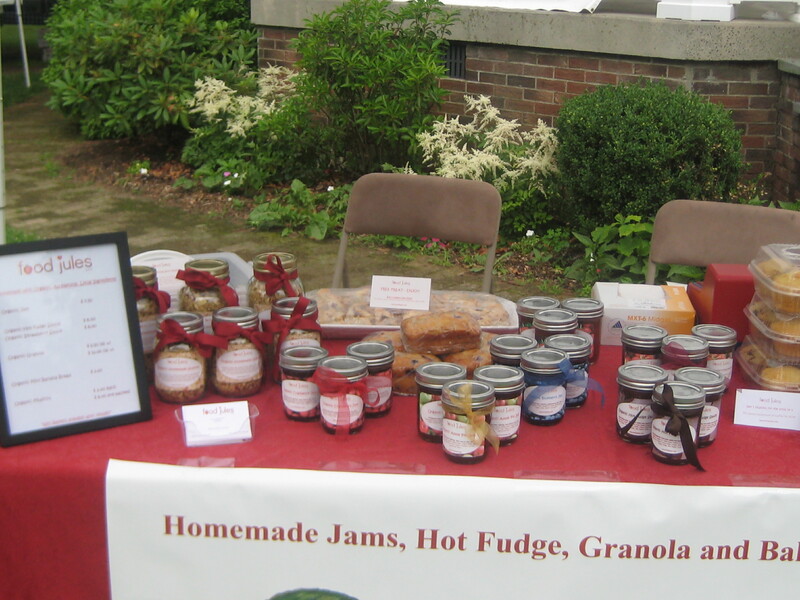 On Friday July 1st, Food Jules will have lots and lots of yummy food including our Organic Jams, Hot Fudge Sauce, Granola and Baked Goodies. I made a double batch of Hot Fudge since it all sold out so quickly last week. Come early if you want to ensure you’ll get some! Tomorrow’s muffins are Blueberry Lemon, Morning Glory and Apple Pie. We will also have Banana Bread and Zucchini Bread. All our baked goods are made from organic, all-natural whole grain ingredients. We will also have Organic Chicken Empanadas, Organic Corn Empanadas and Organic Brie and Jam in Phyllo. I know, I was a very busy girl today. I am SUPER TIRED from all the cooking and baking plus I’ve been getting to bed extremely late and can’t seem to sleep anymore. 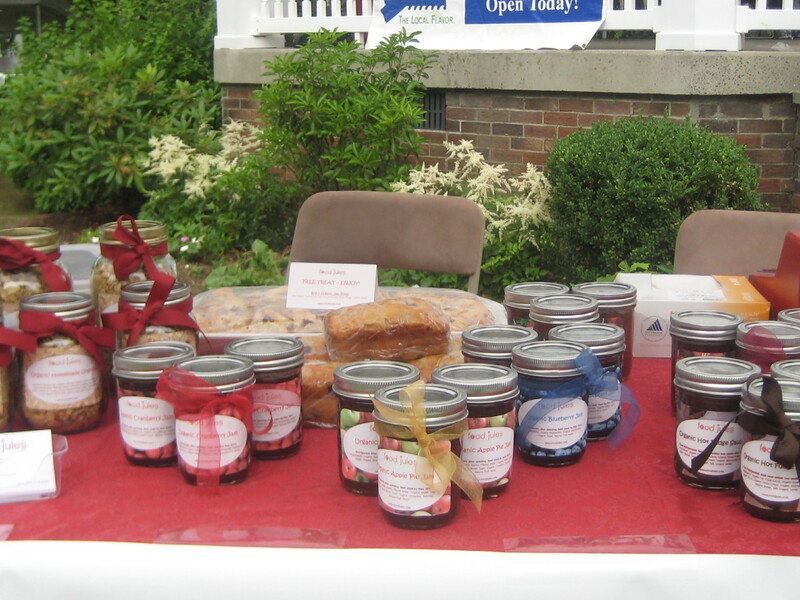 Hope to see you all tomorrow at the Monroe Farmers Market from 3-6pm on the town green, in front of the EWML library. 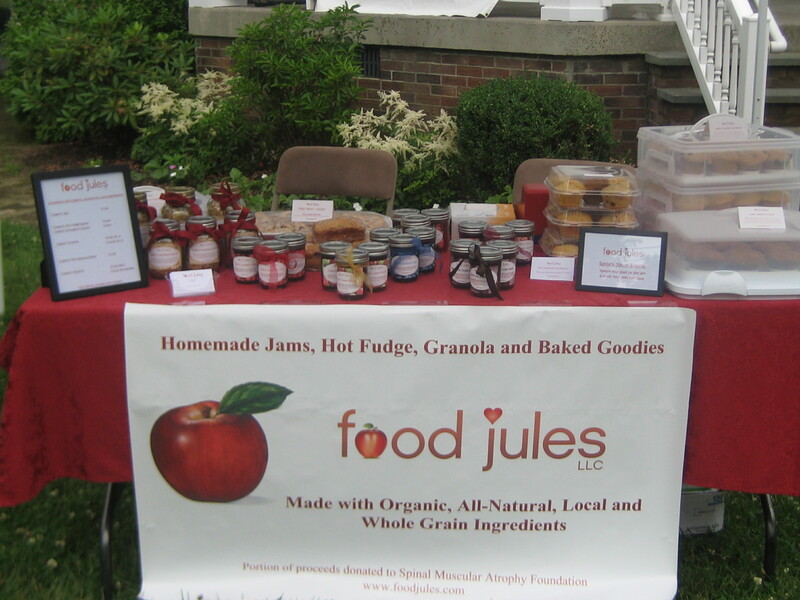 Food Jules was highlighted in the Monroe Patch today in the “Eating Healthy at the Monroe Farmers Market” article. Food Jules was a success today at the Monroe Farmers Market. I can’t believe I did it. I actually did it. I created Food Jules and I brought him to life again. I was able to share him with others today. It was so nice to talk about him. Although I was extremely nervous this morning, everything seemed to flow nicely once the market opened and people started coming by the table. I was so thrilled to see so many familiar faces…. THANK YOU to all of our friends, families, neighbors that stopped over today. Your support meant so much to me and I couldn’t do all of this without your love. Even with a busy afternoon, I couldn’t stop thinking about Julian. As I walked past one of his photos tonight, one of his many ultrasound photos, I cried and told him that I would much rather have him here with me. Food Jules makes me feel a little closer to him. For whatever reason, it does. I hope that I can make him proud of all of our efforts. To share our story with others. To inspire others to love and to be thankful for all of their blessings. Mommy is trying her best Julian. Oh, how I love looking at these photos… I remember holding him and having him close to my chest. I loved it. 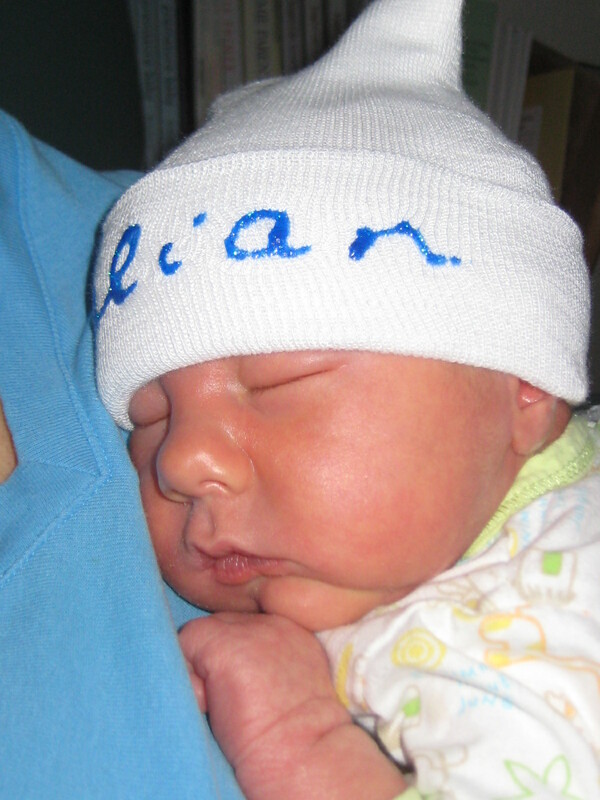 When Julian was born, he was in the NICU and I was downstairs on the maternity floor. Even at 2am, 5am, anytime, I couldn’t wait to go back to the NICU to feed him and hold him again. I LOVED IT. It was the most special memory of him. He looks so sweet and cozy laying against my chest. I wish I could understand why this has all happened. I don’t know if I’ll ever really know why he couldn’t stay with us. I wish so much that I could hold him again. No one knows how much this hurts and how painful it is to think about him and know that he’s not really ever going to come back. This year’s summer reading theme at our town library is “One World, Many Stories”. As part of the kids summer program, Food Jules will be teaching a kids weekly cooking class at the Monroe Town Library. “Cooking Around the World” will feature a dish from a different country each week, from Italy and Portugal to Spain, India and Britain. This class is open for registration for kids in Grades 1-4. Participants will work in teams to create global dishes, learn about nutrition and foster a love of wholesome food and cooking. This is very exciting as I LOVE to cook and LOVE to teach children. I am really looking forward to these classes. 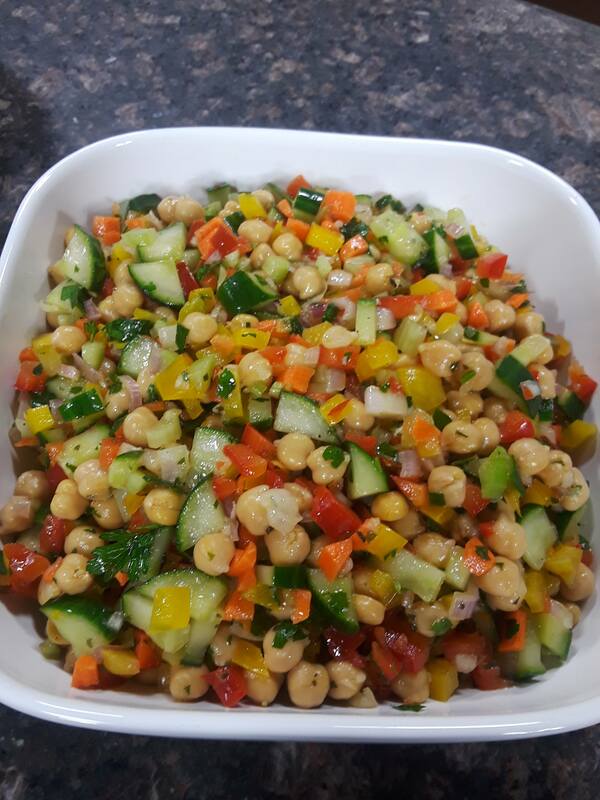 Cooking classes start on July 11th. The library’s International Kick-off Festival, to launch this summer’s reading program, will be on Saturday 6/25 from 10am-4pm. The day is filled with activities for the kids as well as entertainment. Food Jules will make an appearance from 2-4pm with food activities as well as free fruit smoothies and muffins. Town residents, stop over on Friday to visit us and sign up for your kids summer reading. It’s going to be a VERY BUSY weekend!